One the very best new potatoes for the amateur gardener. Excellent boiled and served hot or cold in salads. It was introduced in 1973 so is a modern-type salad potato. It looks good and that's important for new potatoes because they are often cooked and served with their skins still on. For those who love to grow their own potatoes for Christmas Nicola is one of the top varieties. Plant the seed potatoes in August and you will be harvesting fully grown potatoes from late October to December. Nicola is a second early potato with well-shaped oval potatoes. The skin is thin and very light brown with cream coloured flesh. It has good resistance to common and powdery scab, one form of eelworm and leafroll virus. It is susceptible to blight unfortunately. It's one of the best tasting new potatoes and is superb hot or cold. Keeps well in the ground for a month or so longer. Reasonably good disease resistance overall. Nicola is a common variety of potato and is available online, from garden centres and diy store. They are available not only in late winter / spring but also in late summer (for late autumn potatoes). Our choice of supplier for this variety is JBA Seed Potatoes. If you want to buy them for a mid to late summer sowing, our choice would be Suttons Seeds. Buying seed potatoes from the discount store can be a good deal but it can also result in a sub-standard crop. The discount stores take the second quality seed potatoes whereas the more conventional suppliers take the best quality. Unfortunately you will only find this out after you have carefully tended your crop for several months. It's difficult to suggest alternatives to the Nicola potatoes because they are an excellent variety for most gardeners. Our choice would be Maris Peer which has better resistance to blight. They also cook well without falling apart. We recommend that you start chitting / sprouting Nicola potatoes in the third week of February. This will give them four to five weeks to develop healthy sprouts just at the time when they are ready to be planted out. Keep the potatoes in cool but light conditions to ensure they grow short, green sprouts. 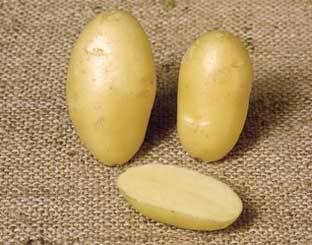 Click here for our page dedicated to chitting / sprouting potatoes in the UK and Ireland. Nicola potatoes are second earlies potatoes and they are ready for harvest, if conditions are correct, 15 to 17 weeks after the seed potatoes are planted. The key factor governing the time for planting all potatoes is the date of the last frost in your area. Even a touch of frost can damage potato plants if their foliage is above ground, an unexpected severe frost can kill them completely. The date for planting Nicola potato seed can be calculated on the basis that seed potatoes will take four weeks before they appear above ground. Given also that you want them to appear above ground only when the danger of frost has passed (the last week of April 2017 is the UK average) the last week of March is about right time to plant them. The table below sets out how good or bad Nicola potato plants are at resisting common pests and diseases in the UK. The 0 point is average with minus (red) values showing lower than average resistance and plus values (green) showing higher than average resistance.